You've seen the character build though. It's a psionic nonphysical alien housed in a robot construct body. I haven't posted it because I deleted all the old fluff and have been struggling to reweave the concept for the 31st century. I suppose I could make him an odd robot version of Validus, but that doesn't really fit with the astral alien idea quite as much. I don't always get writer's block, but when I do...arg. I almost wonder if it might not be better and easier to bring Horus over here. He would work pretty well I think, though loses some of the X-Men context that forms half the character. X-Men and the LSH have a lot in common, truth to tell. And. food for thought, this universe is the future of my Justice League Academy setting. There's less Marvel presence as the Marvel future as I remember it doesn't quite address the same time frame and isn't quite as readily compatible for a combined setting. That sounds like a perfect place for my character. Since it’s XS, it eases them into things which goes into meeting the team. That is unless there is any connection with others on the team. I’m open for any connections if anyone really needs one. I`m in the process of convincing Intrepid to have an interest in the latest Legionnaire. Definitely a good idea. Intrepid, my version and not the original...has a scientific side and is quite interested in temporal mechanics having inherited that particular passion from her father. BTW, Tekhed, Blade just mentioned (and I read) about your idea for Horus. If you bring him in as a time traveler, I'm sure Intrepid would be interested in talking to him. And if Blade doesn't mention it, I will: Solarhawk's background - she's the daughter of Sun Boy and Laurel Kent, but she's also a reincarnation of Hawkgirl... you want connections between characters, that's a pretty good one. Tekhed - if I'm being totally honest, I think I prefer Horus. As Jewel pointed out, ready made link to Solarhawk and all you need is a reason for coming forward to the Legion. Anything but an accident. I'm drafting the info to provide Maverick to get us going again. As soon as Tek makes his decision, I am good to get going again. Actually...I think that does make things so much easier for me. Playing a character with existing ties is way easier than trying to repurpose something that needs to be woven in from whole cloth. Though I was really looking forward to Nexy's powerset...I have yet to play a telepath in MnM. I have done a bit of work on scratch paper to update Horus's build. I should be able to get my new sheet and an updated background up in the next couple of days (knock on wood). A couple thoughts on how to adapt him and bring him in. What if a few years after Avengers Academy he joins up with the combat team of Reed Richard's Future Foundation. This could introduce some time travel and the coolest part is that he has a possible enemy in the 31st Century in the form of Reed Richard's wayward sun Nathan aka Rama-Tut and Hath-Set aka the man who murdered Horus's parents in ancient Egypt, setting up their cycle of reincarnation. Horus probably can't do anything directly to them without risking his own provenance...which a good villain would surely take advantage of. Which leads me to reiterate the desire to have character driven subplots weaving among the greater plot. Kind of how in modern serialized ensemble shows like Game of Thrones, Star Trek Discovery, Man in the High Castle etc. there is the big story they are all marching to, but each character and even side characters get little arcs within. I’m going to work on some ideas between now and Wednesday and want us to start moving forward by the weekend. That’ll give us a week before I disappear for a week and life will then go on. I have an idea that might be better than time travel, maybe. Will try and formulate the thought better and post after work. Years after Justice League Academy, Hawkangel is recruited alongside Beast into the Future Foundation by Reed Richards. Last edited by TekHed on Wed Mar 14, 2018 9:45 pm, edited 1 time in total. While the latter makes it easier on me as a player more unfamiliar with the LSH setting, I can appreciate the former letting us get things rolling without a lot of exposition. Maybe a month? it might be nice to have some kind of vignette where Solarhawk recognizes and greets him after being revived. Out of time for posting today but I'll have time Friday and Saturday to update his build and background and repost here. Hope you can get those posts up today Blade. I hate winter. Especially in March. I do as well. I’m looking forward to it. It’s going to be fun to see how it all plays out. Our newest recruit. A Speedster. Speaking of, RPGCadre, can you post your latest sheet? And, PM sent to EpicEclipse. Speed Force Aura: Immunity 2 [Friction Heat, Disease, Poisons], Regeneration 3 (1 for every 3 Rounds) 5pts. Speed Force Generation: Speed 15 [64,000 MPH], Quickness 9, Enhanced Trait [Dodge 10, Parry 10, Acrobatics+3, Agile Feint, Close Attack 4, Defensive Roll 4, Evasion, Improved Initiative 4, Move-by Action] 62 pts. Speed Force Movement: Movement 3 [Wall Crawling 2, Water Walking (Flaw: Limited to Moving) 3 pts. Speed Stunts: -21 pt. Array 22pts. Vortex Blast: Cone Area Move Object 7 (Extra: Cone Area [60ft Radius] Flaw: Range (Close), Concentration) 1pt. Lightning Blast: Blast 8 (Flaw: Moving Only) 1pt. Responsibility: Protecting Central City or sometimes the world when called upon. Don Allen met Katherine Banes during his stint as The Flash when Barry Allen passed the torch to Don and his daughter Dawn Allen. Don assisted Katherine when the Falcone Crime family tried to force her into using her company Valkyrie International’s ships and airplane to funnel their contraband. They fell in love and were married in three years time. When they had their first child Lydia, Katherine and Don got into repeated arguments about him being The Flash and the fear of him losing his life. Much to her dismay, he continued to carry the mantel of The Flash and spent most of his time assisting the Justice League. When Erica Lynn was born, Katherine was adamant that he stop his “Jet setting” with the Justice League and focus on family. After constant chiding from Katherine and Barry, Don hung up his mask. Five Years had past before Don became The Flash again. When his best friend Officer Stan Breeland was murdered, he chose to become The Flash once more. Now that he’d returned, it didn’t take long for old enemies to rear their heads pulling Don back into his crime fighter role thus distancing himself from his family again. Katherine divorced Don and took Lydia and Erica Lynn to live in New York. Although they were separated he made sure to check in on his family whenever he had the time. When Erica Lynn was older she had a love/hate relationship with Don. She always felt he was never there when she wanted him to be and felt that he cared more about being a hero than being with his family. During her teenage years she did her best to cut ties with him and didn’t have much of a desire to see or be around him. As time passed, she did her best to distance herself from her family and was spending more time with friends or taking part in High School extracurricular activities like Cheerleading, or Performing Arts than wanting to be at home. During that time she met and became close with Charlotte Hawten. The two were inseparable and built up a bad reputation of being troublemakers. Erica Lynn became the thing she hated. The one that would leave for weeks at a time and upon returning would get into fights with Don and Katherine about her choices. When Don and Katherine reconciled Erica Lynn who was upset that Don was back in her life made a choice to leave with Charlotte and go to Los Angeles. As Erica Lynn and Charlotte were watching Simon Williams film Blowback 3 she met Neal Saroyan and hired him to be her agent. When Don found out about Erica Lynn, he told Simon to keep an eye on her to make sure she didn’t get into any trouble and that none of his old enemies weren’t going to target her. Don and Barry began to feel as if the Speed Force had been tampered with or manipulated. After it corrected itself the two began to research the anomaly that had occurred during that week. After a year, they began to see the popularity of the “Mandela Effect”. They soon realized that the anomaly was someone tapping into the Speed Force and bits of alternate realities were dripping out of the speed force. Feeling that Eobard Thawne was behind it, Don and Barry felt that his family needed to be safe. While they were able to wrangle in Lydia and Katherine, Erica Lynn wanted to hold off a few days after Charlotte’s adopted mom said something unusual about someone Charlotte had been visiting. Erica upset that Charlotte had kept this from her followed her to a Mental Institution. After Charlotte left, Erica went in and met the woman Charlotte had been visiting. The woman was Charlotte’s real mother who had a mental breakdown. That night Charlotte and Erica got in an argument about it but Don and Barry showed up warning then of the trouble that might be coming. When Eobard Thawne showed up he confronted Don. As the two fought, Eobard admitted to be apart of a plan where a portion of the Speed Force was taken in order to make a negative one, but he wasn’t alone. After the fight was over,Don and Barry researched the cryptic clues Reverse Flash had given. Erica, Don, and Barry had discovered the woman in the metal institution was one of Eobard’s former girlfriends and that Charlotte was a Thawne. Felling upset and betrayed, Erica went to confront Charlotte only to meet a Lydia Allen from an alternate time line. In that timeline, Don Allen had an affair with Beatriz da Costa. When Katherine found out, she committed suicide leaving Lydia with an intense hatred for Don. She saw The Flash and the Speed Force as the root of the issue and wanted it destroyed. Eobard got inside her head and swayed Lydia to kill this Earth’s Barry and Don. Before Charlotte and Lydia could attack Erica, Don and Barry charge in and began to fight the duo. Lydia took down Don and was about to kill Erica. 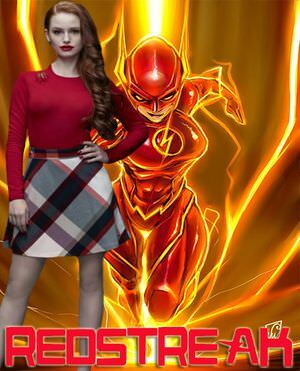 As she sped toward her Erica was pulled into the Speed Force and the last image she saw was a red and yellow lighting bolt heading toward her and striking her. When Erica woke up she discovered that she’d been unconscious for three days. Since Eric a wasn’t hurt and injured she jumped out of bed and began to get dressed as she did she noticed that the others around her were “on pause”. Once she stopped everyone was startled that she moved so quickly. Once Don and Barry were called into the room and they were the only ones to see how fast she was moving, they broke the news that she had the same abilities they had. Erica was reluctant at first and didn’t want any part of the ability she was given. Until she realized that Charlotte,Eobard, and Lydia were still out there. When Erica revealed that her and Charlotte has a hangout spot in Aspen, Don, Barry and Erica Lynn headed there to deal with the trio. When they confronted the three, they all fought until the Flashes got the better of them. Lydia and Eobard retreated, leaving Charlotte alone. Erica Lynn chased after her and stopped Charlotte. Instead of turing her over to Don and Barry, she let Charlotte go due to their past ties. Don and Barry made sure to keep Erica close by as a means to mentor her and teacher her about her abilities. Don and Barry hung up their suits and have let Erica Lynn take up the mantel. Last edited by RPGCadre on Sat Mar 24, 2018 4:13 am, edited 1 time in total.